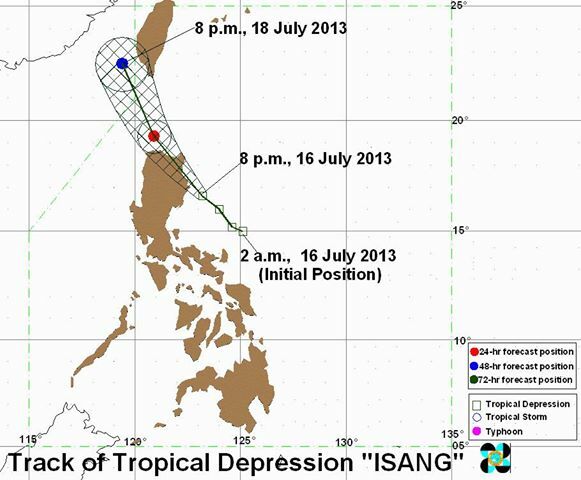 The weather bureau PAGASA issued forecast, July 16, 2013 for tropical depression "Isang". Typhoon 'Isang' has maintained its intensity and expected to make landfall over Isabela-Cagayan area after midnight. Location of eye/center of 'Bagyong Isang' as of 10:00 PM today was estimated based on all available data at 80 km East Northeast of Casiguran, Aurora (16.7°N, 123.0°E). It has maximum winds of 55 kph near the center and expected to move Northwest at 15 kph. Tropical Depression “ISANG” is expected to be at 110 km Northwest of Aparri, Cagayan by tomorrow evening. By Thursday evening it will be at 470 km North Northwest of Aparri, Cagayan or 310 km Northwest of Basco, Batanes. Typhoon “ISANG” will enhance the Southwest Monsoon which will bring light to moderate rains and thunderstorms over Metro Manila and the rest of Luzon and Western Visayas according to PAGASA. Estimated rainfall amount is from 5 – 15 mm per hour (moderate - heavy) within the 300 km diameter of the tropical Depression.